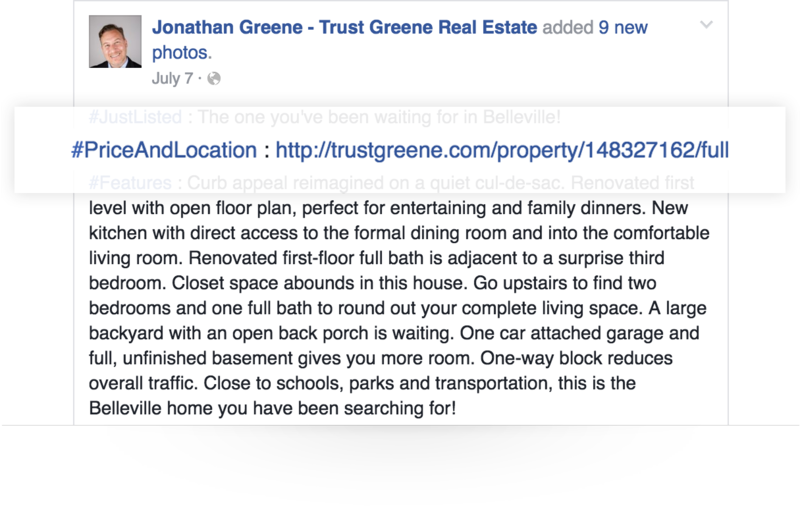 Real estate agent team leader Jonathan Greene’s Facebook ads never performed well. Like a fish on land gasping for water, many of his posts received sparse engagement (comments and reactions), just a smattering of leads and likes. After employing Curaytor’s Facebook marketing playbook, he’s beginning to see results. A July 7 Just Listed post he boosted for $60 has generated over 50 leads, more than 100 reactions and 23 comments, reaching nearly 14,000 people -- the numbers of Facebook marketing gold. There’s a science to Facebook marketing, and Curaytor has been in the laboratory. After millions of client and firm dollars spent on Facebook ads and analyzing the results, it’s sharing the winning formula. “The devil’s in the details,” Curaytor co-founder, author and sales & marketing expert Chris Smith said. Facebook marketing represents a huge opportunity for real estate brokers and agents by offering a cost-effective alternative to expensive portal leads from Zillow Group sites Zillow and Trulia, and realtor.com. But reaping fruit from the Facebook marketing tree requires careful attention to detail. Curaytor has built a business off coaching its approximately 500 clients on advertising with the network. Many of its clients spend at least $500 per month on Facebook ads and Curaytor has insight into all of them. The firm has also pulled learnings from its own ads. Read on for Curaytor’s Facebook Marketing Playbook, a 15 point guide including its recommendation on each of the above. Curaytor constantly evaluates what advertising works and what doesn’t on the fast-changing Facebook platform. It keeps clients up to speed with weekly trainings and coaching. If you want to stay on the cutting edge, consider becoming a client. Find out more here. A Facebook ad without a goal is a boat adrift, lost at sea: leads may show up, but it will be an accident. As most brokers and agents primarily need to fill their sales funnels, most should focus on generating leads and clicks with their Facebook marketing, not branding and awareness, Smith said. Generating leads and pumping them into a database without a smart, streamlined follow-up system is a waste. These elements increase conversion rates over the months-long (and sometimes years-long) journey from lead to buyer or seller client. Curaytor’s tech platform is optimized for effective lead incubation. It features a sleek website, a powerful CRM in Follow Up Boss and the high-performance email marketing system Happy Grasshopper. See how Curaytor is built to maximize marketing by setting up a demo here. To generate leads and website visits from Facebook ads, especially a sustained number over a long period of time, marketers must target monthly audiences in the 40,000 to 60,000 range, Smith said. Of course, specific audience size depends on the particular makeup of an advertiser’s market and lead goals, but the above numbers are a rough average. In short: leave high school behind, think college-sized audiences. However, target audience size should vary depending on goals, Smith added. Sometimes it makes sense to go narrow. For example, if agents want all their current and former clients to see their new promo video, they should consider running the ad multiple times to a tighter audience, Smith said. Facebook offers a staggering number of audience-targeting filters. Narrowing audience by geography and age is usually enough in most cases, according to Curaytor Facebook marketing guru John Mackin. To generate real estate leads from a hyperlocal campaign (at about the neighborhood level), Mackin recommends targeting ages 28 to 65 and leaving other filters untouched. It’s much better to go 10 percent too big than 10 percent too small, he said. You don’t want to wrangle a big fish with a too-small net. Both Smith and Mackin stress that ads perform best when advertisers split audiences up by region, whether that be neighborhoods in a city or areas of the country. Facebook automatically directs ads to the audiences that give the most bang for the advertiser’s buck, which can, paradoxically, leave consumers in some locales untouched if a large enough geographic range is chosen. Curaytor learned this when running national Facebook ads, Smith said. If it ran an ad to the whole country, it showed predominantly to users in just three states: California, Texas and Florida. By spending the same amount of money, but targeting the ad to five smaller geographic regions -- the South, East, Midwest, Northeast and Canada -- the firm reaches a wider, more diverse audience for the same money, Smith said. The same principle holds at the city level. This one’s obvious, but important to note nonetheless. If advertisers want to generate leads from a new five-bedroom, three-bathroom listing, they should target their Facebook ad to an older demographic, those who are more likely to have larger families. On the flip side, if they want to shout about a new downtown loft listing, skew the ad targeting to a younger audience. Smith recommends spending between $300 and $500 per month (at least) on Facebook ads. This spend allows advertisers to spread ads relatively evenly throughout the month, about two each week. Every market’s different, but generally advertisers can expect to receive between 60 and 80 leads per month for monthly spends between $500 to $1,000 (assuming they follow the best practices outlined in this article), Smith said. Given the high return on real estate leads that convert, and even turn into repeat business and referrals down the road, “you almost can’t spend too much,” he added. Ads that run from five to seven days usually perform best, Mackin added. These short periods also help advertisers evaluate what’s working and what’s not. They can then double down on the winners and cut the losers. Facebook advertisers can choose from among five locations for their ads: Desktop timeline, mobile timeline, right rail on desktop, Instagram and Facebook’s ad network. Ads in Facebook’s timeline (both desktop and mobile) perform best, especially for real estate brokers and agents who should be looking for clicks and engagement, Mackin said. Ad copy and images should communicate a crystal clear message so that consumers get the point with just a glance. They also must be enticing, which stimulates clicks and leads. It’s important to use only high-quality images. Rougher images will bring down a Facebook ad more than anything else, Mackin said. If using copy on the image itself, don’t cover more than 20 percent of it. Advertisers can, but Facebook charges more for these ads, and typically it’s not worth it, he added. Advertisers should customize each ad’s copy, Mackin said. Include a clear call to action, a compelling headline and a description. The description won’t always show up by default, but it will increase an ad’s performance, he added. Pro tip: Use multiple photos in ads. This adds more value and leads to greater engagement. Facebook shortens the visible ad copy after a couple of lines, so it’s critical to place links high up, otherwise they could be buried behind a “See More” link. Place links in the first one or two sentences and then again toward the bottom of the copy, Smith said. Provide enough valuable content to catch consumers’ attention, but not so much that they have all they need and avoid clicking the link. Create allure. Advertisers should provide enough detail, information and value to drive engagement -- rich description, number of beds and baths, amenities and photos -- but compel consumers to visit their site to login for more information. Sometimes what’s left out of the copy is more important than what’s in, Smith said. When posting a new listing, for example, use multiple high-quality images of the property and an enticing description, but leave out the address and price, he added. An alluring ad also generates comments, another great place for advertisers to pull in leads. Leads from the comment section account for 15 to 20 percent of the total generated from some ads. Smith and fellow Curaytor co-founder Jimmy Mackin interviewed the CEO and founder of the landing page-focused firm Unbounce on one of their live #WaterCooler web shows. The big takeaway? Landing pages that align with the ads tied to them -- a strategy called “coupling” -- convert at higher rates. For example, if advertisers target sellers in their ad with a specific property, the linked webpage should include an image of that property and prompt homeowners to check their home value. In many cases, the headline, subhead and image on the landing page should match the ad, Smith said. For example, Curaytor’s Facebook ad for its upcoming conference features a sizzle video. The associated landing page opens to the video running in the background. And the first item visitors encounter on the page is the embedded YouTube video. Advertisers’ Facebook marketing strategy should be a living one, John Mackin stressed. In general, they should pour gasoline on the winners and cut the losers, he said. The ad performance dashboard offered by Facebook, Facebook Insights, provides tons of details, but users don’t have to go overboard. Ads’ “reach” and “engagement” are the key metrics advertisers should pay attention to. Advertisers can monitor ad performance from their Facebook Insights dashboard. Reach represents the number of consumers’ feeds the ad showed up in. Engagement measures the total number of actions the ad generated. Advertisers can filter all the posts they ever paid to boost by reach and by engagement in Facebook Insights. In general, reach and engagement track with each other, so advertisers can select just one, Mackin said. After filtering all the posts by reach, look at the top three or four. Assess what may have made them effective and do more ads with those elements. Look at the losers and pick out what may not be working, then avoid those features going forward. To evaluate overall ROI from Facebook advertising, advertisers should look at overall their overall spend versus their growth. Smith and Mackin say it simply: If you're growing, keep going. Brokers and agents should constantly try new things in their Facebook marketing and measure the results, Smith said. Sprinkle Pokemon around an ad’s image or load up the copy with emojis. Advertisers may hit on something that resonates with their market. Hire us to execute the playbook for you. Curaytor works on an exclusive, by-market basis.